The text in the Word 2013 document appears using a certain style of lettering, dubbed a font or typeface. Word comes with dozens of fonts, so you’re sure to find one that meets the needs of whatever project you create. Each font is available in a wide variety of sizes measured in points, with each point being 1/72 of an inch on a printout. (The size it appears onscreen depends on the display zoom.) Text sizes vary from very small (6 points) to very large (100 points or more). An average document uses body text that’s between 10 and 12 points, and headings between 12 and 18 points. 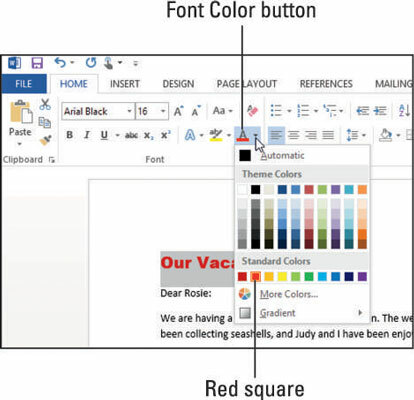 You can also color each font by using either a standard color, which doesn’t change when you change document themes, or a theme color, which does change. You can apply fonts, sizes, and colors either from the Home tab of the Ribbon or from the Mini Toolbar. In Word 2013, open a document with some text. 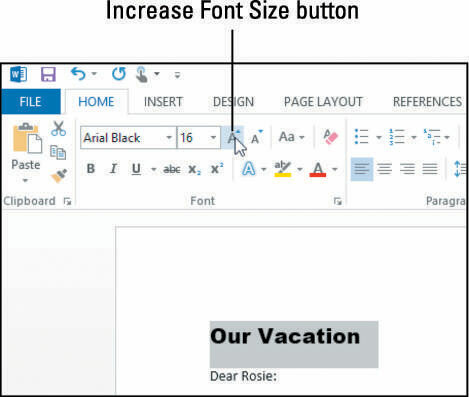 Place the insertion point at the beginning of the document, press Enter to create a new paragraph, press the up-arrow key once to move the insertion point into the new paragraph, and then type Our Vacation. Triple-click Our Vacation to select the entire paragraph. Point the mouse pointer at the selected paragraph so that the Mini Toolbar appears. From the Font drop-down list on the Mini Toolbar, choose Arial Black; from the Font Size drop-down list, choose 14. If the Mini Toolbar is no longer visible, right-click the text to make the Mini Toolbar reappear. For more practice, change the font and font size by using the controls on the Home tab in the Font group on the Ribbon. On the Ribbon, choose Home→Increase Font Size to increase the font size of the selected text to 16 points. Click the down arrow to the right of the Font Color button, and in the palette of colors that appears, click the red square under Standard Colors. Click the down arrow on the Font Color button again to reopen the color palette, and then click the Orange, Accent 6 square on the top row of the Theme Colors section. Pointing at a square makes its name appear in a ScreenTip. For more practice, try some of the tints and shades below the theme colors.